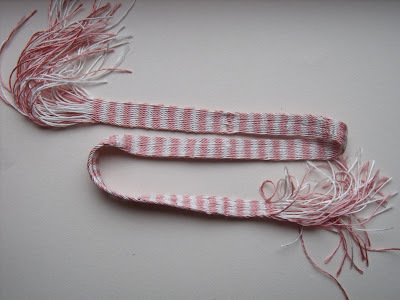 I'm pretty sure there are other examples of period tablet weaving without reverses--so if you're going for something that fits into the general trend of period tablet weaving rather than a replica of a specific piece, I think you could go either way. I agree with Leonor - there are plenty of smaller lengths with no reversal, so, especially as you're making garters, you can continue without I reckon. I don't like them either, though sometimes they do make weaving easier! I do tablet weaving for reanctment as well, and I don't put in reversals either, unless the pattern calls for it. When they are built into a pattern, the reversals aren't as obvious, and you can plan where the weft shows as a part of the overall design. I follow your blog for time, now I have one own. Very interesting site! Congratulations. Greetings from Spain. Very good site! Looks very nice and clearly explained.The photos are beautiful and very illustrative. We will follow you from Spain. Greetings. Stunning. I'm currently learning this thechnique on my school. We've also been learning a weaving thechnique when you use a "braid gate" to weave. Do you know what it's called in English?